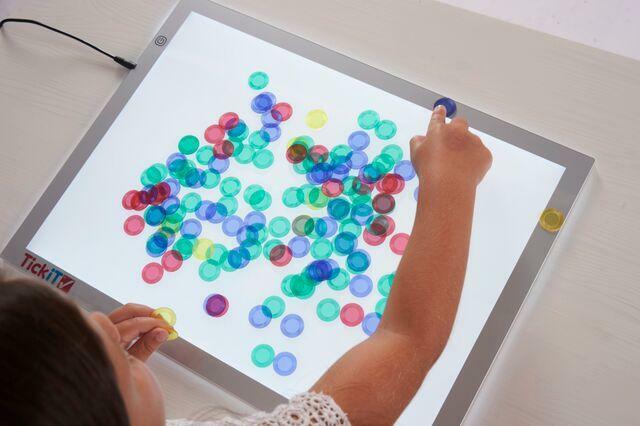 This LED light panel with 3 light settings is an essential and versatile cross-curricular resource. Providing a cool, clean, bright illuminated background, it is ideal for the investigation of light, color and shape, or for focused group work in a wide range of curriculum areas. Slim design with rounded edges, this award winning light panel is tough, portable and easy to wipe clean. Simple operation and lock function to prevent panel from being turned off unintentionally. Great for learning centers and small groups. Typical life span for the low energy LEDs is approx 50,000 hours. Dimensions: L: 18.11" x W: 13.39" x H: .31"